They have an experienced and trained team of staff who specialise in all types of insurance. As an independent broker they have developed various specialist schemes with their many underwriters for many types of insurance. With this flexibility and range of cover available, they can offer very competitive premium rates with excellent insurance cover. They believe in personal service, and many clients choose to have a personal account handler and ask for them by name. Our staff are trained to find you the best policy at the best best price, and provide you with the best service possible. They apply this ethos to all the insurance products they supply. They have special schemes for car insurance for all types of cars and drivers, van insurance, business and commercial insurance, together with household insurance and have recently launched a custom bike scheme. “The business relationship we have built with Sure Communication during the past four years continues to grow and I am pleased to say that they are now the preferred provider for our Web presence within our Group. 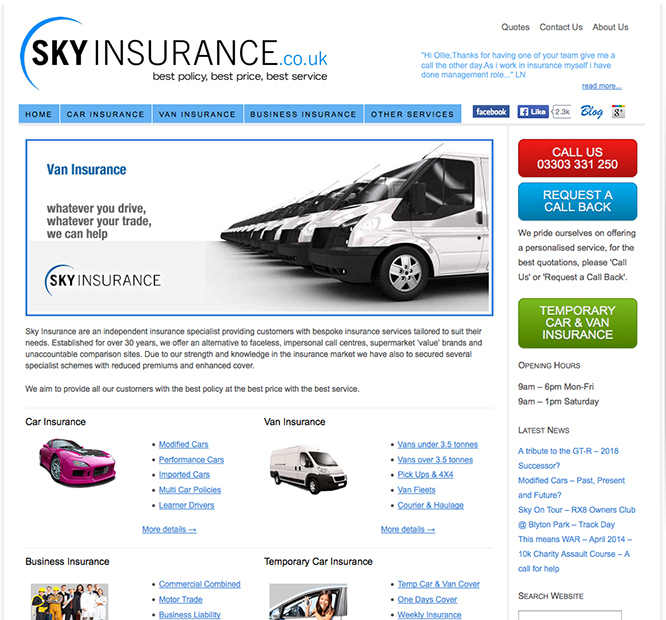 We have recently upgraded the Sky Insurance Website to take advantage of the latest technology recommended to us by Sure Communication”.